Joey Barton wants Saturday’s first home win as Fleetwood Town boss to be the first of many. Barton’s maiden Highbury victory will live long in the memory as his men battled on with 10 men to record a 2-1 win over Bradford City. Ched Evans had seen a goal chalked off before ensuring his name was on the scoresheet after bundling home an Ash Hunter cross in the 12th minute. Town were pegged back when Jason Holt was ruled to have fouled George Miller inside the box and Eoin Doyle put Bradford back on level terms from the penalty spot. They then saw Wes Burns sent off for a challenge on Adam Chicksen – a decision Town are set to appeal – before Hunter scored three minutes into the second half. Barton thanked the fans for being Town’s 11th man in that second half and helping them over the line. He said: “It is nice to get the monkey off the back at home because I felt we were 20 seconds away from it against Rochdale but we are finally there now. “We have got to turn this place into a fortress if we are going to have a successful season. “We have been outstanding on the road and we just have to keep making sure that we do what we do because we are a good team, a very good team. “The crowd were with us, the place was bouncing and an absolute privilege to be a part of it. “I’m telling you it is massive, it is massive for the players and they feed off the energy in the stadium. “To a man I think the players took on what the fans were giving them, you could hear them willing them on and driving them on. When asked about how he is finding the refereeing levels in League One given Burns’ red card, Barton would not critique Andy Haines and his assistants. He said: “They have a tough enough job and they do not need me criticising them. “It is certainly different, we have had some really good officials at games, some really good officials on the whole. “When you get a penalty given against you and a player sent off it is natural that you would be upset. “If we had lost the game, we probably would have been upset. Barton had made 11 changes from the midweek Carabao Cup defeat at Leicester. 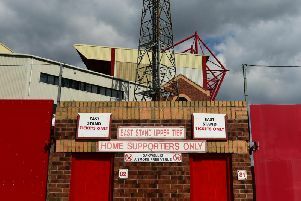 He reverted back to the side that drew 0-0 with Charlton Athletic and it paid dividends, Town making it five unbeaten in a row and sitting sixth ahead of a trip to Sunderland. He said: “On the back of winning 5-0 at Scunthorpe and competing heavily at Charlton we made changes for the cup because it was not a priority. “I think that paid dividends. If I had played most of those lads in the cup game and we had gone down to 10 they would have really struggled for energy. “It is nice to feel vindicated as a coaching group, we made decisions. “We have got the full support of the chairman (Andy Pilley) and the club when we do that. “It is always nice when it pays off. “Had we gone differently at Leicester on Tuesday and gone down to 10, ran out of energy and lost the game then I would have been kicking myself about missing an opportunity. “Not that results vindicate the process, but in this one, you have to give everyone in the coaching room, medical staff and sports science staff a pat on the back.